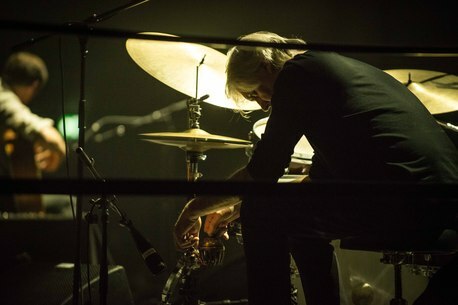 The Australian trio The Necks played a haunting 4 hours improvised concert with 'A' Trio (Mazen Kerbaj, Raed Yassin, Sharif Sehnaoui) at the 2018 edition of MaerzMusik festival inside the Kraftwerk hall of Berlin. 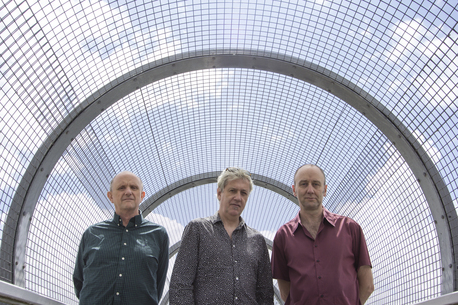 Comprising Lloyd Swanton (double bass), Tony Buck (drums) and Chris Abrahams (piano), The Necks is among the most advanced improvised music groups to encounter. We met the drummer Tony Buck a few hours before their concert to discuss about music collaborations, Australian music scene and much more. Tony is regarded as one of Australia’s most creative and adventurous exports, with vast experience across the globe. 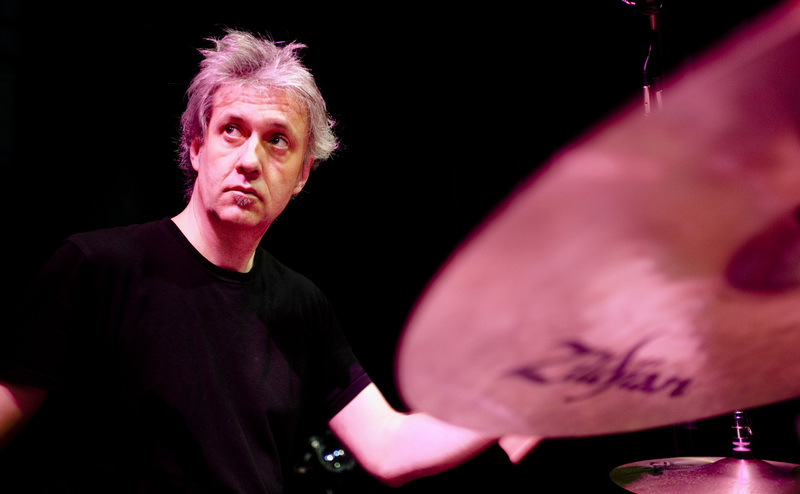 As a drummer, percussionist, improviser, guitarist, video maker and producer, he has been involved in a highly diverse array of projects but is probably best known around the world as a member of the trio “The Necks”. Tell us a little bit about this project of tonight, how did you come up with the idea of playing with 'A' Trio? We are really good friends and we had talked about the option of playing together for some time . And, you know, opportunity of playing together isn’t something that comes along everyday, but then, this festival proposed the idea and it was a good chance to get to do it. Have you played together before? We’ve never played together as both trios before. I know these guys for years and we’ve played in different combinations, but The Necks have never played with „A” Trio. We’ve talked about it a lot before but you know, it’s hard to find the opportunity to do it, . Mazen (Kerbaj from „A” Trio) and I, we both live in Berlin so we know the deal about playing at MaerzMusik and both bands have played at MaerzMusik before, but never together obviously. They are also enthusiastic about both bands playing together. We are very different, but we have this shared overlapping interests in textual playing and durational playing, improvising etc. Did you envision the concert in a way or will it be completely based on improvisation? It will be purely improvised, yes. I think one thing is important here, that it is not so much six people playing together; it’s two trios, and that is a very different thing. Even though within four hours there will be opportunities to do different combinations, drop out and drop in, so it won’t always be two trios, but that’s the beauty of doing this. it will be open but based on these shared aesthetics. What about the dynamic of a trio? Three is a very special number. As soon as you get to four, all the options exponentially increase and get more complicated. In a trio, the options are of solos, duos, trio… different combinations of A-B, B-C, A-C, and then counterpoint. So it is kind of a perfect number - being quite straightforward but offering up interesting possibilities. So the duo between two trios, of course you have this exponential increase of possibilities, but at the same time the aesthetic of both groups will be like a duo. 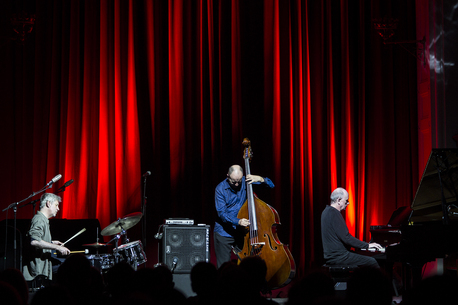 With The Necks, how do you work together during a concert? We walk on stage and one thing we do is somebody starts, but we don’t know who will that be. It is just the first person who starts playing. We don’t know who might be until somebody starts. That’s how we work as a trio. You were born in Sydney. How is the music scene there? Yes, we were all born in Sydney. You know, it’s good. It has its ups and downs, of course, it goes through different cycles from different periods. At the moment, I think Sydney is quite healthy even if there aren’t many venues to play. It’s making people do concerts in all kind of strange spaces, shopfronts, warehouses or people’s living rooms. Sydney’s been through that before. There have been periods where there was a big thing with the squat culture in the city. There were times when Sydney has been really rough with few places to play and there was not much going on. There’s an interesting dialogue between Sydney and Melbourne. Melbourne seems to be a much more cultural oriented city, while Sydney is a very financial oriented city, very very beautiful, but very expensive. In Melbourne, culture is more organic to the nature of the city. But I think Sydney at the moment is pretty good with artist run initiatives. It’s a bit underground and maybe if you go there as a visitor you might not know what’s going on because unlike other cities, like London, Melbourne or New York - Sydney is a bit more hidden, a lot of which has to do with some licensing laws about closing venues and gentrification and noise complaints by the assholes who want to live in the hip neighborhood but not deal with the vital energy of the culture. Sydney’s unfortunately very expensive. Is it more expensive compared to London? Well no, Sydney and Melbourne are very expensive but probably not as expensive as London,. There’s a lot of great musicians in Sydney, a lot of young musicians who are doing great things. There’s a lot of focus on the interesting creative path and they are not so tied to different scenes that try and copy things happening overseas, like they have in the past. There are great jazz musicians, great punk musicians and great rock bands in Australia, but in the past sometimes there has been a lot of taking overseas artists as a role model. 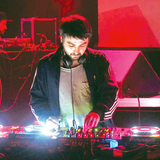 But I think in Australia at the moment, in Sydney and Melbourne, especially in improvised music, there are a lot of very original artists to see, they have their own identity, not so much copied from American or European models, which is really good. What about the new musicians? Is there a new generation active? Yes, there are a lot of young people really active. There is this whole scene of young musicians who seem incredible versatile to play classical musical, really complicated new music, to improvise well and play with rock bands and folk bands. The quality of musicianship is very high it seems, it’s pretty healthy in that way. Coming from Australia had any impact on your music? Can we refer to an Australian sound? People often ask about that, I think there is a sense of a slow moving, which is something that we do, but it wasn’t consciously meant to reflect Australia. All the desert, I know, but we all grew up in Sydney, which is a very big metropolis. Despite that, there is this thing about drone music and slow music, even within Australian rock bands, maybe that’s a quality in Australian music. Also the isolation of Australia, in the sense of world and culture, has made it interesting even with copies of styles from overseas. The generation who came before us, if they were, for example, interested in jazz, they would just hear it from records and sometimes there were these strange kind of Chinese Whispers version of jazz that wouldn’t really sound like how they played jazz in America. It was translated through records, and nobody really saw how people were doing things, so sometimes it was a weird interpretation. You probably can see that in rock music as well, the English and American blues rock. Isolation makes for strange kind of copies, right? Do you often collaborate with European musicians? Personally I do because I live in Berlin, and The Necks does a little bit. For example, we’ve collaborated with musicians such as Evan Parker and Brian Eno in London, so we do that a little bit. But The Necks operates mostly in this tight unit of three people, but occasionally we do collaborate, but it’s not something that we do constantly. About eighteen years ago. I lived in Amsterdam before that for four years and in Tokyo for a couple of years. I go to Australia once a year at least. The last couple of years I’ve been there twice, early in the year and then in the middle of the year. You play more frequently in Berlin then? Yes, also The Necks have been touring very frequently, like a month on, a month off. We’ve done three or four tours in Europe, two in USA, occasional tours in Asia and in Australia in the east few years. We played in Japan and in China, just before that, and it was very different from touring in The States or Europe, where people know our music or they are more used to these artistic traditions of improvising, but it’s interesting. What was the most recurring feeling you had in the last years? I don’t know if one feeling has been recurring more than others. After thirty years, it’s really gratifying that people get to know us in cities like London and Berlin, especially in the last four, five years. I begin to feel like these are also hometown gigs for us, which is really gratifying. That’s the most recurring feeling, this awareness that slowly more people are following what we’re doing. Do you follow any new music these days? Is there anything that has impressed you lately? Yes, as much as possible. We’re discovering new music all the time, sometimes it’s not always new, it’s music that’s been around for a while or you rediscover things that you’ve been listening to a lot. I know I’ve spent some time in the last year or two listening to Algerian music, music from Mali, desert guitar music, for example group Inerane, group Doue, those Malian guys from Sublime Frequencies. I’ve been listening to a lot of Pygmy music lately, that’s a big rediscovery. I’ve listened to a bit before, rainforest music. Also the music of Jerry Hunt, even stuff from Bob Dylan. There are different periods that you go through, uncover, rediscover. I can’t really name one that I have recently discovered and that has blown me away, we’ve been very busy with things. I guess the latest I’ve been listening to is the local music here in Berlin when I can, Not that I haven’t engaged with that before - I’ve been listening to the scene here for twenty years! Do you know any Romanian musician, such as Iancu Dumitrescu and the Hyperion Ensemble? I don’t know them personally but I know the spectral composers and I’ve been listening to that quite a bit lately mainly because my girlfriend is doing a PHD in spectral analysis in psycho-acoustics as applied to artistic practices. But apart from that, I don’t know any improvisers. There’s also a piece tonight by Horațiu Rădulescu. What would you, as an artist, say to young musicians who are trying to find their own path? The music industry has changed so much in the last few years that sometimes I wouldn’t know where to start. But it all comes down to playing a lot and be interested in exploring and finding new music, playing with friends, talking about music and listening to music. When I was growing up in Sydney I enrolled in the Conservatory to study music, but mainly it was just to find out what what other people are doing and playing together, I wasn’t really so interested in getting an education. It’s great to learn as much as possible, but for me then it was much more about the networking that was available there. If you can find like-minded friends, I would just encourage people to do that. How do you see failure in the improvised music? It’s an interesting idea. You learn from failure, and really, failure is a very subjective thing. Maybe failure is also about having a qualitative judgement. It depends on how you view what you have set out to do, whether there is success or failure. It’s a relative term, so if you don’t operate on that relative kind of duality in first place, success verses failure, then failure is not really a concern. You learn from things that come out not really as expected or you learn not to expect too much, like the duality of expectations and outcomes. Maybe improvising musicians don’t deal with that process and are not interested in how people will interpret or misinterpret their music. If you engage in the process with integrity, then there is no failure. It’s just a process and you are diving into this pool that is your life, it’s all one process. If you put too much emphasis on failure or success, maybe improvising is not the best thing to do.